A Green Living Blog that tries to make it easier for everyone to become a little more green. ► All schoolbooks were made from hemp or flax paper until the 1880s. ► It was legal to pay taxes with hemp in America from 1631 until the early 1800s. ► George Washington, Thomas Jefferson and other founding fathers grew hemp. Jefferson smuggled hemp seeds from China to France then to America. ► Benjamin Franklin owned one of the first paper mills in America, and it processed hemp. Also, the War of 1812 was fought over hemp. Napoleon wanted to cut off Moscow’s export to England. ► For thousands of years, 90% of all ships’ sails and rope were made from hemp. The word ‘canvas’ comes from the Middle English word “canevas” which comes from the Latin word cannabis. ► 80% of all textiles, fabrics, clothes, linen, drapes, bed sheets, etc., were made from hemp until the 1820s, with the introduction of the cotton gin. ► The first Bibles, maps, charts, Betsy Ross’s flag, the first drafts of the Declaration of Independence and the Constitution were made from hemp. ► The first crop grown in many states was hemp. 1850 was a peak year for Kentucky producing 40,000 tons. 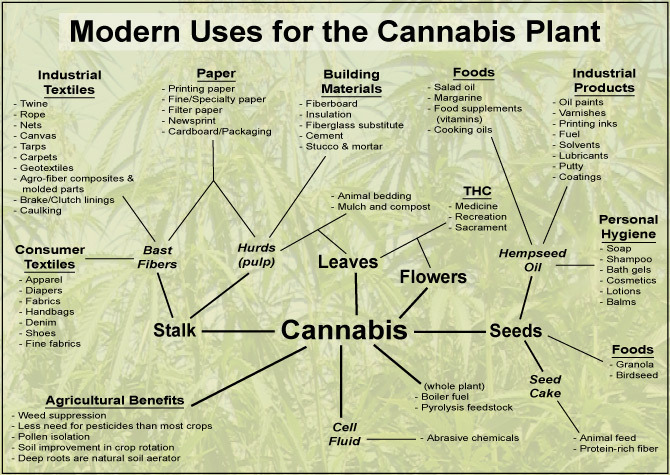 Hemp was the largest cash crop until the 20th century. ► Oldest known records of hemp farming go back 5000 years in China, although hemp industrialization probably goes back to ancient Egypt. ► Rembrandt’s, Van Gogh’s, Gainsborough’s, as well as most early canvas paintings, were principally painted on hemp linen. ► In 1916, the U.S. Government predicted that by the 1940s all paper would come from hemp and that no more trees need to be cut down. Government studies report that 1 acre of hemp equals 4.1 acres of trees. Plans were in the works to implement such programs. ► Quality paints and varnishes were made from hemp seed oil until 1937. 58,000 tons of hemp seeds were used in America for paint products in 1935. ► Henry Ford’s first Model-T was built to run on hemp gasoline and the car itself was constructed from hemp! On his large estate, Ford was photographed among his hemp fields. The car, ‘grown from the soil,’ had hemp plastic panels whose impact strength was 10 times stronger than steel. ► In 1938, hemp was called ‘Billion Dollar Crop.’ It was the first time a cash crop had a business potential to exceed a billion dollars. Did you know Human Hair is Recyclable?